1974 was a great year for pop music and the pop song. It was the year of Seasons In The Sun by Terry Jacks, Benny And The Jets by Elton John and the marvellous When Will I See You Again by the Three Degrees, one of my all time favourites. But it was also the year when 10cc released their second album Sheet Music, an album that is a very evident leap forward compared to their self titled debut album from the previous year. Sheet music was recorded at Strawberry Recording Studios in Stockport Cheshire, simultaneously with Mike McGear´s album McGear, produced by his well known brother Paul McCartney and the same drum kit was actually used for both recordings. Billboard concluded that the album had “some of the most innovative vocal techniques and instrumental arrangements around” and that is maybe most evident from the first single, the stiff but equally marvellous The Worst Band In The World. It´s fabulous to see how the band uses small, small means to create great and stunning effects – just listen to those bass lines! Remembering correctly isn´t the easiest thing to do. What we find sensational one day may most certainly lay flat on the ground the next. And the opposite way around. Maybe that´s all in the human nature – our opinions on things changes in the same vein as we ourselves do. Some time ago I made two unexpected observations. During the 70s it was difficult for a teenage European to miss out on glam rockers Slade and Sweet – just think of their ridiculous outfits! Still, Slade always had a nose for good melodies and interesting packaging. They were quite adventurous too, with their use violins and slow piano ballads when everybody was expecting the a new rock explosion! I bought a remastered “best of” album with Slade some years ago and was immediately flabbergasted when I once again heard the magnificent Far, Far Away from their more than good film Flame. I have some good memories of that song but, as it turned out, I may not have realized all of its qualities at the time. A memory thing again, per chance? Some time ago I listened to an old live show with Sweet. At that time I was quite comfortable with the idea of Sweet as stupid teenyboppers, a bit like David Cassidy with make up. The show was from the mid 70s and again I was surprised – I didn´t hear the outrageous glam rockers but rather a high-octane fueled rock´n roll band, much more resembling Who than fellow glamsters Mud. After Poppa Joe, I never thought I´d be saying this! Find out for your self – it´s all there at www.wolfgangsvault.com – I can promise you´re in for a surprise! However, sometimes the memory plays no tricks at all. 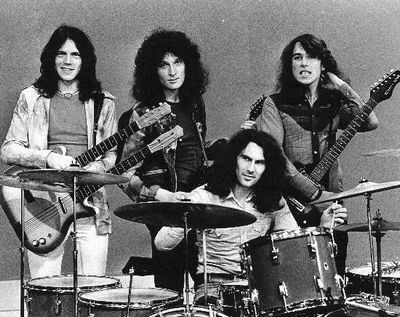 Dutch rockers Golden Earring were named after Peggy Lee´s hit Golden Earrings from 1948, a song that used to open their shows. The band was founded already in 1961 in Haag, Holland and their first album was released way back in 1965. The band eventually dropped the plural “s” in Earrings in 1969 when they started to tour the US – as one of the first European bands. During 2011, as the band is nearing its 50 year anniversary, the band will record a new album in legendary Abbey Road studios in London. Some bands have more stamina than others, obviously! Here below is the first and foremost of behind the wheels songs – Radar Love, from an excellent performance and with an equally brilliant introduction by Little Richard.